Used the 12" length personalized ribbon with the linen color fold-over favor envelopes/bags containing packaged candies as party favors for a b-day luncheon, and the final product resulted in many compliments. The ribbon looked lovely tied at the base of the Asian silk fans also purchased. The personalization (bride and groom's name on one end of ribbon,wedding date on opposite end) really added such a nice embellishment. 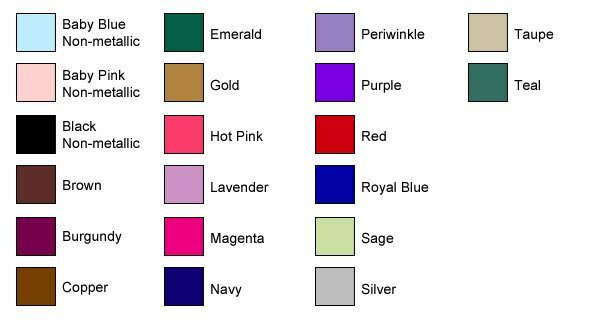 We ordered printed ribbons for a retirement party in our colors: purple with gold printing. We tied bags of candy for the guests with them. They were a big hit! The guest of honor loved them and the guests were impressed. We got a big impact for a very reasonable amount of money! I really liked how my favors turned out. I put the personalized ribbon around the miniature cowboy hats, dated and titled for our family reunion. I punched a small hole in the back edge for an ornament hook and they are Christmas ornaments. The family loved them. Tied it on Christmas ornaments. Looked beautiful however some ends started to unravel. I used this product on favors for my goddaughters christening. 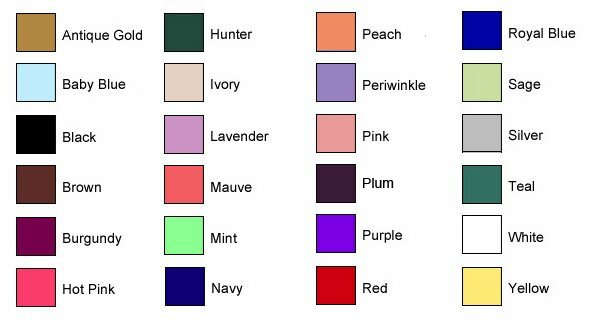 I searched all over for the color combination that we wanted and no online stores would do it. Beau-coup did and we got it in a timely matter. The only problem I had was that the ink came off a few of the ribbons when touched. But overall my experience was good and I would use them again. I purchased the ribbons to tie around chop sticks to personalize them for a double surprise party. This gave a personal touch to our business cocktail/reception & was very classy. Would definitley order again. I used this ribbon to personalize gift bags for my daughters Christening. I also purchased the personalized Honey jars. Everything was purple and white, so I bought white linen-type small bags, put the Honey Jars, and some Hershey kisses (silver and purple foil) then tied the personalized ribbon (also purple) around it. Everyone loved them..and it was so easy! Bought these ribbons for my daughters baptism favors which were mini bamboo plants. they were easy to work with. love these! I made my own favors for my daughters baptism and the ribbons turned out perfect. The material was good, the lettering did not fade or come off. I was very pleased. - Please handle ribbon gently and with care. There is a possibility that ribbon may fray during the shipping transit when ribbon is shipped cut into pieces. However, no fraying occurs when ribbon is shipped uncut on a spool. You are to cut in between the imprint so you have a left and right print. Every ribbon order includes approximately 10% extra. - Ribbon samples available upon request. Please contact customer service by phone 877-988-2328 or email info@beau-coup.com. Tie personalized double-face satin ribbon to your special occasion favors, party favors and stationary to add a personal touch. Our favor ribbon is not designed for wrapping but for personalizing your party favors and gifts. Printing will only appear on each end of the ribbon, with the middle left blank for tying. 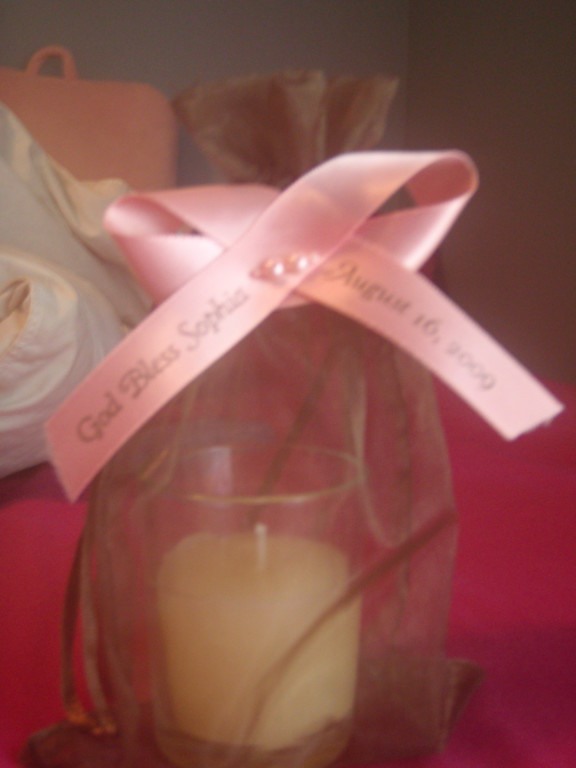 A popular way to personalize your favors is to print a name on one end and the party date on the other. Choose from our standard lengths. We recommend 12-14 inches for a standard bow (ribbon length needed will vary depending on the item you are tying). There is a 36 character limit total for each piece of ribbon (combined total for both ends cannot exceed 36 characters). Note that the maximum text limit on each end uses about 2" of space from the end of the ribbon. We also offer personalized double faced satin ribbon with continuous print. Unfortunately we are unable to print lettering with accent marks.